March - the third month of the year in the Gregorian calendar brings with it the Spring Equinox and the promise of warmer days and shorter nights. 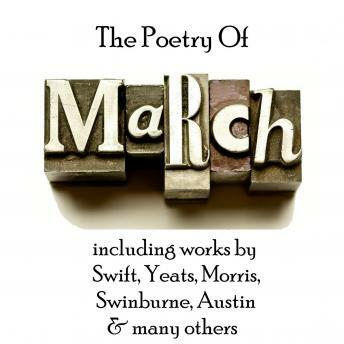 Our selected poets including Swift, Yeats, Morris, Swinburne and Austin of course provide the words to match the mood. Among our readers are Richard Mitchley and Ghizela Rowe. The tracks are; March - An Introduction; A March Minstrel By Alfred Austin; A March Snow By Ella Wheeler Wilcox; In March By Archibald Lampman; My Little March Girl By Paul Laurence Dunbar; Very Early Spring By Katherine Mansfield; Four Songs For Four Seasons By Algernon Charles Swinburne; To A Daisy Found Blooming March 7th By John Hartley; Monadnock In Early Spring By Amy Lowell; March By John Payne; Lines Written In Early Spring By William Wordsworth; March By Alfred Edward Houseman; Sonnet XLIII. The Malvern Hills, March 12th 1835 By Henry Alford; Stella's Birthday, March 13th 1727 By Jonathan Swift; The Message Of The March Wind By William Morris; Letter From Town: On A Grey Morning In March By D.H.Lawrence; The Welsh March By A E Houseman; March Evening By Amy Lowell; From A Full Moon In March - Parnell's Funeral By William Butler Yeats; Written In London On The 19th March 1796 By Matilda Betham; March - An Ode By Algernon Charles Swinburne.